You are here : Home > Posts > Interviews > Jochem Braakman: St. Petersburg? A European City Mixed With The Russian Soul! Jochem Braakman: St. Petersburg? A European City Mixed With The Russian Soul! Jochem is a Dutch student who came to Saint Petersburg to study for a semester at the St. Petersburg state University in 2014. Since early February to the end of June he had enough time to visit all major landmarks, see the famous white nights and raising bridges and talk to the Guide to St. Petersburg about his stay here. As Mr. Braakman is a polyglot, he gave his interview in four languages: English, Dutch (of course), German (he lived there a few years fiercely supporting the Borussia Dortmund football club) and in Russian (which we publish in our Russian version). Jochem, what are your impressions of the city? How could St. Petersburg be compared to other cities, such as Amsterdam, Moscow or Dusseldorf? What is the difference between Russia and other countries? I am really impressed by St. Petersburg as a city. The city is a metaphor of beauty and it breathes history and culture. Although the city is quite young compared to other European cities, one still can find many buildings in different styles. From Baroque over Classicism until Jugendstil. You can find them all. Of course, you will find the typical Russian buildings, reminding ones of the Soviet era. Those are lying more on the edge of the city. From the edge to the center of the city you will travel backwards in time. St. Petersburg is a very beautiful and astonishing city, which will give you goosebumps by its impressing architecture, its great the Neva river. Wherever you walk, you cannot deny and avoid the beauty. While walking past the Neva, thinking of the great music of composers, such as Rachmaninov or Tchaikovsky, I am always overwhelmed. 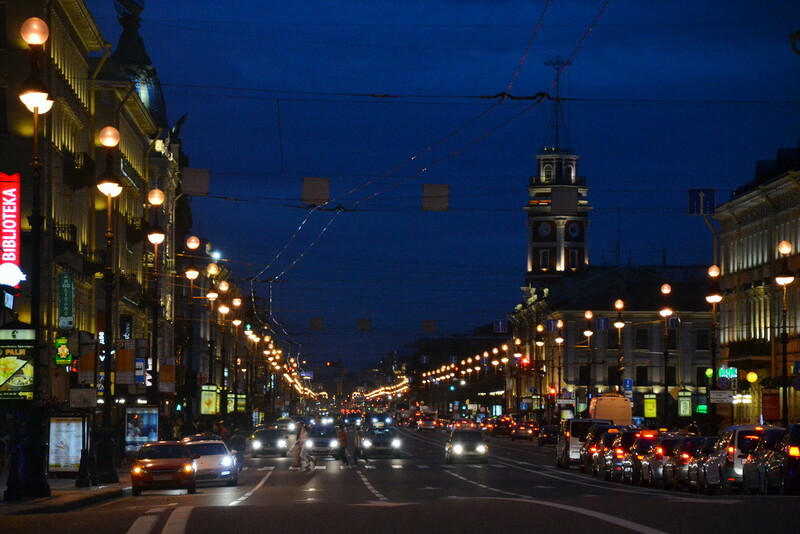 From my point of view, St. Petersburg is a European city mixed with the Russian soul. 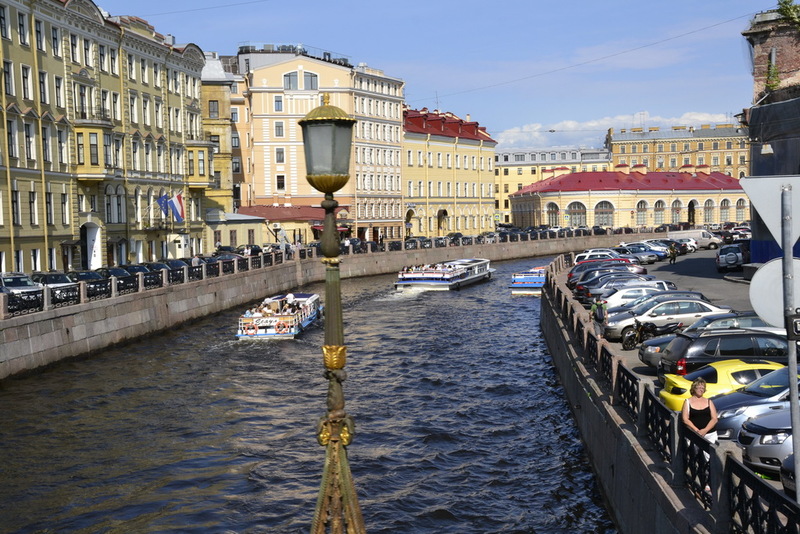 The canals in St. Petersburg are inspired by the example of Amsterdam. One could think that the city looks very similar to Amsterdam. This is, of course, not true. The special location of St. Petersburg and its own architecture make it a unique spot in the world. The difference in culture, development of the cities, architecture, the rivers, the surface and the lives of its inhabitants make it impossible to compare St. Petersburg with Amsterdam and vice versa. Also Moscow is a city which is incomparable to St. Petersburg. From my point of view Moscow is a typical Russian city. That means, that you will not find any European architecture as in St. Petersburg. Although Moscow is much bigger than St. Petersburg, you will not get the impression that Saint Petersburg is small at all. Moscow is an accumulation of small centers. St. Petersburg therefore represents a whole. This impression is connected to the fact that both cities suffered a different development. The first time I entered the territory of the Russian Federation was in December 2012 at the airport Pulkovo. I was very impressed by the fact that I am now in Russia. I have had the feeling, that I was not discovering a new world. No! I was discovering a more interesting universe! Unfortunately, I just stayed one week, but I really enjoyed every minute of it. Where do you think should tourists go who do not speak Russian at all? In which museums, theaters, palaces have you been? Which attractions would you recommend in an order from very important to less important ones? I recommend every tourist to discover the centre of the city, because there you will find most of the interesting museums, buildings and cultural events. A very small amount of people in St. Petersburg is able to speak English on a fluent and conversational level and therefore some knowledge of Russian will be always an advantage. On the other hand, you will find your way with a little sense of humor, hands and feet. The more you want to go to the edge of the city or even outside of it, the more knowledge of Russian language will be required. You will have to take some marshrutka (about transport system read here) or elektrichka (commuter train) to get to these places. There people will speak probably only Russian and communicating could be difficult. I have visited the Mikhailovsky and Mariinsky theatres, the Hermitage, the Erarta museum (recommend everyone to visit that), the Russian museum, some orthodox churches, the Peter and Paul fortress, the palace of Katherina the Second, Pavlovsk and Peterhof. But there are still more attractions to find, which I did not sum up. I loved everything about Saint Petersburg, only the weather can be sometimes disappointing. It rains there very often and it sometimes happens that you will have to face temperatures down to minus 20 degrees Celsius. From more important to less important I recommend the following attractions: The Russian museum, the Peter and Paul fortress, the Hermitage, some churches, the Erarta museum and if you have some time left you should visit the palace of Catherine the Second in Pushkin, Pavlovsk and Peterhof (depending on the season). What could you say about the tourist service in St. Petersburg? Is there enough information available in the city or not? The touristic service is provided by some information centers and the offer of some excursions throughout the centre of the town. It is a pity that I cannot tell anything about the quality of those services, because I have never been using them. I advise everyone who does not possess the knowledge of Russian to buy some book treating St. Petersburg. It is also useful to learn the Russian alphabet, because many words as “cafe, coffee, museum», etc. are similar to the English ones. I think the touristic infrastructure is great from the airport if you will not arrive that late. If you will arrive around 00.00 at Pulkovo airport, you will need a taxi to the city and the metro will not work. From 05.00 a.m. to 00.00 the infrastructure is superb. The metro network is just fantastic, and the marshrutkas and buses do their work. Nobody should forget that St. Petersburg is a very big city with 5 million inhabitants. Therefore distances are long and as a result you will also need some time to travel through the city from A to B. Which more advices could you give to English-speaking people who would like to travel to St. Petersburg? I would recommend everyone to visit at least once this great and beautiful city. Nobody will regret that. Try in advance to know something about the city and make some plans because there is plenty much to see! What do you generally remember of your stay(s) in St. Petersburg? Were there some highlights? Has happened there something funny or interesting? My most emotional episode in St. Petersburg was when I first visited the city. I have deeply fallen in love with a Russian girl, and she showed me in one week her town. We went to the ballet and had a great time together. I really love to think about the special atmosphere and feelings during my visit. It is a pity that we now have lost contact and that we never could have a serious relation. How safe have you felt in St. Petersburg? The better your knowledge of Russian is, the safer you will feel in the city. Of course, some unexpected things can always happen. What zijn jouw algemene indrukken van de stad? In hoeverre kun je verschillen benoemen met de steden zoals Amsterdam, Moskou of Düsseldorf? In wat voor een opzicht is Rusland anders dan andere landen? Ik ben erg onder de indruk van Sint-Petersburg als stad. De stad ademt geschiedenis en cultuur. Al is de stad redelijk jong voor Europeese begrippen, zo zijn er vele gebouwen in verschillende stijlen gebouwd. Dit gaat terug tot de barokarchitectuur met voor Europeanen ongebruikelijke kleuren zoals lichtblauw en groen, die men bij gebouwen kan vinden en misschien ty perend zijn voor oosteuropeese landen. Vanaf barok via klassicisme zijn er ook vele gebouwen in “Jugendstil” te ontdekken. Ook typische Russische flats kan men buiten de stad vinden, die erg aan het tijdperk van de Sovietunie herinneren. Hoe dichter men bij het centrum komt, hoe meer men terug in de tijd reist. Zo reist men van buitenaf vanuit het huidige en modernere Rusland steeds meer terug in de tijd door zich richting het centrum te begeven. Sint-Petersburg is een erg mooie en indrukwekkende stad die emoties losmaakt door haar oneindige pracht. Overal in het grote centrum waar je maar loopt, men kan haar niet o ntwij ken: De schoonheid komt op jou af. Denkend aan de muziek van Rachmaninov of Tchaikovsky, wandelend langs de Neva in combinatie met de prachtige architectuur wordt ik altijd weer overweldigd. Ik beschouw Sint-Petersburg als een europeese stad vermengd met de «Russische ziel». De kanalen in Sint-Petersburg zijn geïnspireerd aanhand het voorbeeld van Amsterdam. In dat opzicht zou men misschien denken, dat het erg op Amsterdam lijkt. Niet is minder waar. Sint-Petersburg is een stad die door zijn speciale ligging en zijn eigen architectuur uniek is. Een verschil in cultuur, stadsontwikkeling, architectuur, de rivieren, de oppervlakte van de steden, het leven van de mensen maken dat Sint-Petersburg niet met Amsterdam te vergelijken is en andersom. Ook Moskou en Sint-Petersburg zijn moeilijk te vergelijken. Moskou is in mijn optiek een typische “Russische” stad. Dat wil zeggen dat er weinig of geen europeese architectuur te vinden is zoals in Sint-P etersburg. Moskou is veel groter en heeft meer inwoners dan SPB, maar toch krijg ik het gevoel dat Moskou een ophoping is van kleinere centra. Bij Sint-Petersburg krijgt ik de impressie, dat het één groot geheel is. Dezeindruk is onlosmakelijk verbonden met de geschiedens van beide steden. De eerste keer toen ik de Russische federatie betrad was in December 2012 in Sint-Petersburg op de luchthaven “Pulkovo”. Ik was meteen gefascineerd door mijn aankomst in Rusland, omdat ik echt het gevoel had, dat ik een compleet nieuwe wereld, ja een nieuw universum aan het ontdekken was. Ik vond het een erg prettig en aangenaam spannende ontd ekkingstocht. Waar moeten toeristen heengaan die geen Russisch spreken? Op welke plaatsen, dat wil zeggen musea, theaters paleizen ben je zelf geweest? Welke indrukken zijn achtergebleven? Wat heeft je bevallen, wat heeft je niet bevallen? Welke bezienswaardigheiden zou jij aanbevelen in een volgorde van belangrijk naar minder belangrijk? 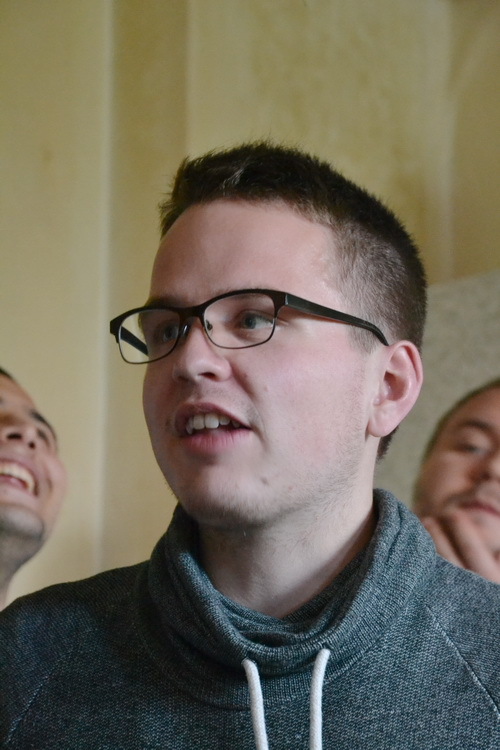 Ik adviseer de toeristen vooral veel rond het centrum rond te lopen, omdat zich daar de meeste musea, interessante gebouwen en culturele evenementen bevinden. Weinig mensen in Sint-Petersburg spreken goed Engels en kennis van de Russische taal is voor iedere tourist een voordeel. Aan de andere kant kan men met handen en voeten en een beetje humor goed in de stad goed terechtkomen. Maar als men buiten de stad wil gaan is een kennis van het Russisch, of een Russische kennis erg handig om te hebben, omdat men voor deze plaatsen buiten de stad met een marsjroetka of een elektritsjka moet nemen. Mensen spreken daar alleen maar Russisch en mensen met kennis van de Engelse taal zal men met een grote waarschijnlijkheid niet tegenkomen, behalve dan andere touristen. Zelf ben ik in het Michailovskiy- en Marinskiy theater in de Hermitage, het Erartamuseum (een aanrader), het Russische museum, in verschillende kerken geweest, op de Peter en Paulvesting, in het palijs van Kath erina de Grote, in Pavlovsk en in Peterhof geweest. Maar er zijn nog heel veel meer andere bezienswaardigheden, die ik niet opgenoemd heb. Alles heeft mij in Sint-Petersburg bevallen, alleen het weer kan soms een beetje tegen zitten. Het regent er vaak of het is erg koud. 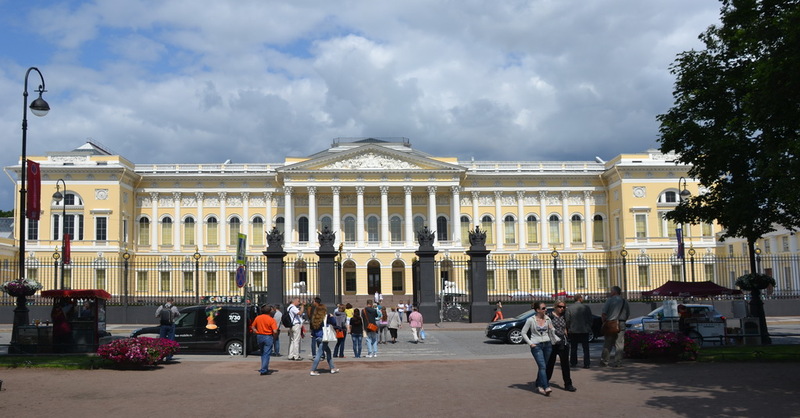 Ik adviseer eerst het Russische museum, de Peter en Paulvesting, de Hermitage, de verschillende kerken, het Erartamuseum en als men tijd, geduld en het goede seizoen gekozen heeft, het paleis van Katharina de Grote, Peterhof en Pavlovsk te bezoeken. Wat kun jij over de service voor touristen in Sint-Petersburg zeggen? Is de stad aangenaam voor touristen georganizeerd? Is de informatievoorziening in de stad voldoende of ni et? Waren er geen problemen met het oriënteren, het zoeken van de juiste straten en gebouwen? Wat kun jij in het algemeen zeggen over de touristische infrastructuur — beginnend vanaf de luchthaven/ het station tot aan excursiediensten! De touristische Service wordt verzorgd door informatiecentras en verschillende aanbiedingen van excursies. De kwaliteit ken ik helaas niet precies, omdat ik daarop nooit aangewezen ben geweest. Ik raad iedere tourist aan, die geen kennis van het Russisch heeft, een boekje over Sint-Petersburg te kopen. Belangrijk kan ook de kennis van het cyrillische alfabet zijn, omdat de leenwoorden in het Russisch voor “cafe, koffie, museum etc” erg op de Nederlandse of Engelse woorden lijken. De touristische infrastructuur is vanaf de luchthaven geweldig en prima als men niet te laat aankomt. Mocht men na 00.00 uur op Pulkovo landen, zo zal men een taxi naar de stad moeten nemen en ook de metros zullen helaas niet rijden. Verder is vanaf 05.00 uur tot en met 00.00 de infrastructuur erg goed. Het metronetwerk is buitengewoon fantastisch, de bussen en marsjroetkas doen hun werk. Men mag niet vergeten dat Sint-Petersburg een stad van 5 miljoen mensen is, dus men moet begrijpen dat de afstanden groot en de reistijden daardoor wat langer zijn, dan men misschien gewend is. Wat heb je in het algemeen behouden? Wat waren de meest heldere episodes? Misschien is er iets gaafs of grappigs gebeurd? Mijn meest emotionele episode in Sint-Petersburg had ik, toen ik de eerste keer er naar toe vloog. Omdat ik erg verliefd was op een Russisch meisje en zij mij een hele week de stad liet zien, wij naar het theater gingen en leuke dingen deden, heb ik daaraan erg goede herinneringen aan overgehouden. Helaas heeft deze verliefdheid nooit een vervolg van een vaste relatie gehad. Hoe veilig heb jij je hier gevoeld? Hoe beter de kennis van het Russisch is, hoe veiliger men zich zal voelen. Onverwachte dingen kunnen natuurlijk overal en altijd op de wereld gebeuren. Welke adviezen of aanbevelingen kun je aan Nederlanders geven, die naar Sint-Petersburg reizen? Aan alle mensen zou ik vooral willen mededelen, dat je minstens één keer in je leven in Sint-Petersburg geweest moet zijn, men zal er geen spijt van ondervinden. Men zal de mooiste stad van de wereld bezichtigen! Probeer vooral wat te weten te komen over de Peter de Grote en zijn reis naar Nederland. Welche Eindrücke haben Sie von der Stadt erhalten? In wiefern unterscheidet sich die Stadt von Städten wie Amsterdam, Moskau oder Düsseldorf? In welcher Hinsicht unterscheidet sich Russland von anderen Ländern? Ich bin sehr beeindruckt von der Stadt Sankt-Petersburg. Die Stadt atmet Kultur und Geschichte. Auch wenn für europäische Verhältnisse die Stadt recht jung ist, so besitzt die Stadt ihre Diversität in der Architektur. Von Barock, mit für Europäer ungewöhnlichen und typisch russischen Farben versehenen Gebäuden, über Klassizismus bis hin zu Jugendstil. Man kann allen Stilen begegnen. Aber auch die typisch russischen Hochhäuser, die uns an die Architektur der ehemaligen Sowjetunion erinnern, wird man dort finden. Man könnte eigentlich die folgende Regel aufstellen: Je näher man zum Zentrum gelangt, desto mehr man in die Zeit zurückreist. Außerhalb das Zentrums findet und sieht man das heutige Russland und im Zentrum das Russland unter Herrschaft des Zaren Peter des Großen. Sankt-Petersburg ist eine sehr schöne und beeindruckende Stadt, die Gefühle auslöst durch ihre unendliche Schönheit. Man kan ihr nicht ausweichen. Eingedenk der Musik von Tschaikovsy oder Rachmaninoff, spazierend entlang der Neva bin ich immer wieder gerührt. Sankt-Petersburg ist für mich eine europäische Stadt, geprägt von der russischen Seele. Die verschiedenen Kanäle, die man in Sankt-Petersburg vorfinden kann, sollen wohl anhand der Stadtarchitektur von Amsterdam inspiriert worden sein. Man könnte deshalb denken, dass Sankt-Petersburg sehr der Stadt Amsterdam ähnelt. Dies ist nur begrenzt wahr. Sankt-Petersburg ist eine Stadt, die, durch ihre speziale Lage und ihrer atemberaubenden Architektur, einzigartig ist. Die Unterschiede in Kultur, die Entwicklung der Stadt, die Architektur, die Flüsse, die Größe der beiden Städte und das Leben der jeweiligen Menschen dort, machen es unmöglich Sankt-Petersburg mit Amsterdam gleichzusetzen. Auch Moskau und Sankt-Petersburg kann man nur schwer vergleichen. Aus meiner Sicht ist Moskau eine typisch “russische” Stadt. Das heißt, dass es dort wenig oder fast keine europäische Kultur vorzufinden ist. Das ist in Sankt-Petersburg dennoch anders. In Moskau findet man überall orthodoxe Kirchengebäude. Moskau ist auch von der Stadtstruktur anders. Moskau ist eine Zusammenfügung kleiner Zentren. In Sankt-Petersburg ist die Struktur der Stadt eher einheitlich. Das erste Mal als ich die Russische Föderation betreten habe war im Dezember 2012 in Sankt-Petersburg am Flughaven “Pulkowo”. Ich war nach meiner Landung direkt fasziniert von Russland. Ich hatte das Gefühl, dass ich in einer neuen Welt, vielleicht sogar in einem neuen Universum angekommen bin. Ich fand dies eine sehr spannende Angelegenheit und habe meine Entdeckungstour unheimlich genossen. Wo sollten Turisten hingehen, die die russische Sprache nicht verstehen? In welchen Museen, Theatern , Palästen sind Sie selber gewesen? Welche Eindrücke haben Sie gehabt? Was hat Ihnen gefallen, was hat Ihnen nicht gefallen? Welche Sehenswürdigkeiten würden sie in einer Reihenfolge von wichtig bis hin zu weniger wichtig empfehlen? Ich empfehle den Turisten, sich vor allem im Zentrum zu orientieren. Dort befinden sich die meisten Museen, beeindruckende Gebäude und kann man an kulturellen Programmen teilnehmen. Man sollte zur Kenntnis nehmen, dass sehr wenige Menschen in Sankt-Petersburg eine ausreichende Kenntnis des Englischen haben und deswegen ist eine Sprachkenntnis der Russchen Sprache immer von Vorteil. Andererseits kann man mit eine Portion Humor, Händen und Füßen auch gut in der Stadt zurechtkommen. Je mehr man sich in Richtung Außenstadt bewegen will, desto wichtiger ist es russische Sprachkenntnis zu besitzen. Das ist dem geschuldet, dass wenn man mit einer Elektritschka oder Marschrutka fahren will, Russischkenntnisse fast erforderlich sind. Selber habe ich das Michailovsky und Marinsky theater, die Eremitage, das Erartamuseum (Empfehlung), das russische Museum, verschiedene Kirchen, die Peter und Paulfestung, der Palast Katherina der Großen, Pavlovsk und Peterhof besucht. Aber es gibt immer noch genügend andere Sehenswürdigkeiten, die ich hier niet aufgezählt habe. Ich kann wenig negatives über Sankt Petersburg berichten. Das einzige Problem könnte das Wetter sein: Es regnet dort sehr oft und im Winter kann es sehr kalt sein. Man muss dabei an Temperaturen von bis zu minus zwanzig Grad Celsius denken. Als erstes sollte man das Russische Museum, die P eter und Paulfesting, die Eremitage, verschieden Kirchen, das Erartamuseum besuchen. Sollte man darüber hinaus noch etwas Zeit haben und befinden Sie sich in der richtigen Saison, sollte man den Palast der Katherina der Großen, Peterhof und Pavlovsk besichtigen. Was können Sie sagen über die Qualität des turistischen Service in Sankt-Petersburg? Inwiefern ist die Stadt dem Turismus gewachsen? Sind die Informationen über Sehenswürdigkeiten ausreichend? Gab es keine Probleme mit der Orientierung, dem Suchen von den Straßen und Gebäuden? Was können sie über die turistische Infrastruktur der Stadt sagen, angefangen vom Flughafen bis hin zu Exkursionsdiensten? Der turistische Service wird durch Informationszentren und verschiedenen Angeboten von Exkursionen gewährleistet. Ich kann wenig über die Qualität sagen, da ich nie auf diese Informationen angeweisen war. Ich empfehle jedem Turisten, die keine Russischkentnisse besitzen, sich ein Buch in ihrer Sprache über Sankt-Petersburg zu kaufen. Die Kenntis des kyrillischen Alphabets kann sehr nützlich sein, da viele Wörter im Russischen wie “Cafe, Kaffee, Museum etc” den deutschen oder englischen Wörten ähneln. Die turistische Infrastruktur ist sehr gut vom Flughafen aus, wenn man denn nicht sehr spät bei Pulkowo landet. Nach 00.00 kann man nur noch mit einem Taxi zur Stadt und gibt es keine Gelegenheit das U’Bahnnetz von Sankt-Petersburg zu verwenden. Ab 05.00 Uhr bis 00.00 Uhr hat man eine gute Infrastruktur. Das U-Bahn etz der Stadt ist fantastisch, die Busse und Marschrutken tun das Ihre. Es sollte erwähnt werden, dass Sankt-Petersburg eine Stadt mit 5 Millionen Einwohnern ist. Dies bedeutet, dass Abstände in der Stadt von A nach B groß sein können und deshalb die Reisezeiten innerhalb der Stadt lang sind. Was ist Ihnen am meisten in Erinnerung geblieben? Was waren die aufregendsten Episoden? Vielleicht ist etwas außergewöhnliches oder lustiges passiert? Meine schönste Zeit in Sankt-Petersburg, war als ich zum ersten Mal dorthin geflogen bin. Ich war sehr verliebt in ein russisches Mädchen und sie hat mir eine Woche lang die Stadt gezeigt und wir sind zusammen in ein Ballett gegangen. Ich habe an dieser kurzen Zeit sehr gute Erinnerungen behalten. Leider hat meine Liebe zu ihr nie eine Fortsetzung in Form einer Beziehung gefunden. Wie sicher haben Sie sich hier gefühlt? Je besser die Russischkenntnisse der jeweiligen Person, desto sicher wird man sich in der Stadt fühlen. Unerwartete Dingen können natürlich immer und überall auf der Welt passieren. Welche Empfehlungen würden sie anderen Deutschen machen, die diese Stadt besichtigen würden? Ich würde allen Menschen raten, dass man wenigstens ein Mal in seinem Leben in Sankt-Petersburg gewesen sein sollte. Man wird es nie und nimmer bereuen, da man die wahrscheinlich schönste Stadt der Welt besichtigen wird.